For most of its history, the banjo has been associated with only two kinds of American music: Dixieland jazz and bluegrass. Of course, there have may have been a few minor departures, and to be technically accurate, variations of the banjo have turned up in folk cultures around the world. But for the most part the banjo has meant Dixieland or bluegrass, depending on whether it's the four-string or five-string variety. If you have listened to enough of these album reviews, you have probably guessed by now that I'm just setting the rhetorical scene for banjo music that defied the stereotype. 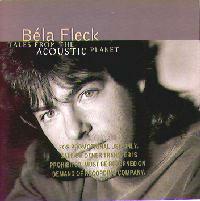 And any banjo fan knows that the artist who has, by now, done more to explode banjo stereotypes than any one in musical history, is Béla Fleck, who has just released the most remarkable album in his extraordinary career, entitled Tales from the Acoustic Planet. Fleck, since his teenage days attending New York's High School of the Performing Arts, has always been a standout musician. He was winning bluegrass banjo contests in at age 15 or 16, and not long afterward finding fast friends in the world of so-called New Acoustic Music as it was taking fire in the 1980s. Pioneered by musicians such as David Grisman and the band New Grass Revival, the New Acoustic style took the instrumentation of bluegrass and began combining the complex harmonic approach and swing-influenced rhythm of jazz along with the free-wheeling instrumental improvisation that is shared by both bluegrass and jazz. The result was some of the freshest music of the era to come along. Fleck did play a lot of straight bluegrass, but on his debut solo album, recorded at the age of about 21, he included a bluegrass version of Chick Corea's jazz fusion classic Spain, played on his banjo. Recording an impressive series of albums for Rounder Records all along, Fleck eventually joined New Grass Revival and spent eight and a half years with the group, who had no compunctions about playing reggae, R&B or Irish traditional tunes. At the same time, he kept busy with solo albums, serving as a record producer for artists like Maura O'Connell, and being a Nashville studio musician extraordinaire. In 1988, through what Fleck still remembers as very unlikely circumstances, he received a call from a young African-American bass player from Virginia who auditioned for him over the phone. Fleck was immediately drawn to Victor Wooten's style as doing on the electric bass what Fleck had been doing on his banjo, with the same level of skill and eclecticism. Victor's brother, Roy who was working on playing percussion by using a guitar-like synthesizer controller connected to the sound-generator of a drum machine, was also recruited along with keyboard man and harmonica iconoclast Howard Levy to form the Flecktones, still one of the most interesting and unusual instrumental groups around. Levy left a couple of years ago, but Fleck has been applying his banjo to this extremely eclectic and otherwise electric band and wowing audiences with their albums and extensive touring. For me, the most exceptional thing about Béla Fleck is not that he is taking the banjo to stylistic places it has never been -- and in 15 years of recording he has certainly crashed through more genre barriers with his instrument than any banjo player before him, or that his skill and facility on the banjo is prodigious, but rather, that Béla Fleck is one of the most creative composers and arrangers in contemporary instrumental music, regardless of instrument. He just happens to be a banjo player. Over the years, he has composed a large body of work that is as musically sophisticated as anything from the world of jazz or fusion, and remarkably diverse in influences, cheerfully borrowing from almost any style that moves him, from funk to New Age. The fact that he does all this as a banjo player makes it all the more fascinating. Tales from the Acoustic Planet gives Béla Fleck an opportunity to highlight both his ability as a composer and his remarkable ease in moving among styles in a series of collaborations with some blue-chip musicians from some of those various genres. The guest list includes pianist Chick Corea, bluegrass and New Acoustic guitar virtuoso Tony Rice, jazz saxophonist Branford Marsalis, oboe player Paul McCandless, one of the founders of the seminal group Oregon who were an influence to many a New Age artist, rock pianist and on this album non-vocalist Bruce Hornsby, a string quartet, and the Wooten Brothers, his rhythm section with the Flecktones. By the way, since this is an acoustic album, Roy "Future Man" Wooten played a lot of the percussion using his hands and sticks on the resonator portion of different banjos. This is a generous hour-long album that doesn't waste a moment with filler material. Fleck, in his typically friendly liner notes, says the album was recorded in a series of sessions between January and March of last year, in both Nashville and on the West Coast. The material ranges from a duo with Chick Corea to larger groups with added strings or horns. Just about every piece is different stylistically. Fleck writes that the album "revolves around several interlocking musical relationships... My plan was to introduce my favorite musicians and best musical friends to each other and take a trip to the musical well together." He continues that "the tunes were written over the last 20 years. A lot of them were from my private stash, the ones I liked almost too much to record up until now (if that makes any sense). I suppose I was waiting for the just the right setting for them." Over his career, Chick Corea has recorded some amazing duets with such people as vibist Gary Burton and fellow jazz pianist Herbie Hancock. Corea and Fleck have at it on an original by the banjo man called Bicyclops. Even as remarkable a musician as Béla Fleck went into the session with a little trepidation. He was told by Bruce Hornsby, when informed of the planned encounter with Corea "You better start practicing now." Despite Fleck's liner notes saying "No amount of practicing could prepare me for the shock of hearing him in the [studio] for the first time," Fleck more than holds his own in a wonderful exchange by the two disparate virtuosos. It's the highlight of this brilliant album. <<>> After it's all over, Corea can be heard playfully saying "I won!" For fifteen years, Béla Fleck has been creating some of the most interesting, intelligent and joyously eclectic contemporary instrumental music on record. The fact that he has been doing it as a banjo player, and in the process taking his chosen instrument to entirely new realms is all the more exceptional. His new album Tales from the Acoustic Planet is a kind of pinnacle to which his career has been leading. It's an extraordinary series of musical collaborations that embody some of the various influences upon which Fleck has been drawing, from bluegrass to jazz to Celtic even to New Age. The result is superb listening, and an album that's destined to become a milestone. Sonically, the album is up to its musical value. The mix is clean and virtually free of electronic effects. Especially pleasing is the lack of compression. The average volume on the CD is softer than typical for most rock albums which tend to have their dynamic range decimated by compression in mixing and mastering. But this recording preserves the dynamics of the acoustic instrumentation, and a wide dynamic range was the reason compact discs were invented in the first place. All in all, Béla Fleck's Tales from the Acoustic Planet will stand as one of the year's finest albums.